A Petach Tikvah court extended the remand of the Shechem resident who went on a driving, knifing spree in Tel Aviv this week. 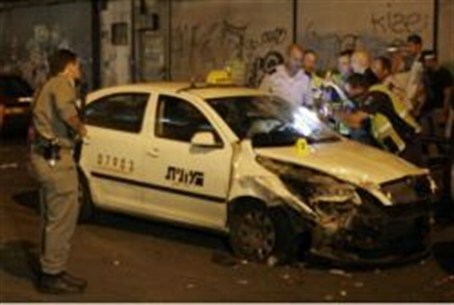 The man, a resident of PA-administered Shechem (Nablus) in Shomron (Samaria), whose name has been withheld pursuant to a media blackout on all details of the investigation, was arrested after ramming a taxi he carjacked at knife point into police officers who were protecting the Haoman 17 nightclub on Sunday morning, before he launched a stabbing spree. Law enforcement officials said the man, an Arab who was heard screaming "Allahu Akbar" during the attack, would be charged with attempted murder and armed robbery. Security services say the terrorist seems to have operated alone.